The Sounds are concluding a seven-game Texas road trip today as they wrap up a four-game series in San Antonio. Tuesday they’ll open a seven-game homestand against the two clubs they’ve seen on this road swing – Round Rock (Astros) and San Antonio (Brewers). Below is an audio rewind of pregame interviews from the game broadcasts in case you missed one. Among the topics, you’ll hear catcher Jett Bandy discuss the origin of his first name, reliever Tim Dillard recall actor Will Ferrell “pitching” against the Sounds for Round Rock in 2010, Hendersonville native and MTSU alum Zac Curtis discuss playing in his hometown, Rangers instructor Dwayne Murphy remembering his time in the World Series as the 2001 D-backs hitting coach, hitting coach Howard Johnson on the anniversary of his major league debut (4/14/82) and manager Jason Wood on the week that’s been for the Sounds. Hope to see you Tuesday at First Tennessee Park! Thanks for listening…on the air and off. In case you missed it last week, our latest “Rounding Third” Podcast episode, and first of ’19, was released. The always-entertaining Tim Dillard was kind enough to stop by First Tennessee Park on his way to an off-season workout as he prepares for Spring Training with the Rangers. I’ve posted the Podcast below, but if you go HERE, you can subscribe in iTunes, listen to other past episodes, and (please) rate and review the Podcast. It’s exciting that Dillard is likely going to be back in a Sounds uniform this year. After 16 years with the Brewers, including several years in a row (’07-’14) playing at least part of each season with the Sounds, he has signed a minor league contract with the Sounds’ new parent-club Rangers. If he’s with the Sounds, he’ll get the fun and rare opportunity to once again play at home, as he and his family have called Nashville home for many years. Enjoy the Podcast! HERE is my personal favorite Dillard video, which I reference in the Podcast. The Sounds’ parent-club Texas Rangers officially introduced their new manager today in Arlington, as former Sound Chris Woodward (’08) takes the helm. He received a three-year contract with a club option for 2022 and was introduced by Rangers President of Baseball of Operations Jon Daniels. If you’ve followed this blog in recent weeks, Woodward’s name probably rings a bell. He was part of the “Former Sounds in the MLB Playoffs” series due to his previous role as third base coach for the two-time defending NL-champion Dodgers. Woodward is widely respected around the game by players and his peers, and you can get a glimpse of that by reading why he chose to wear number 8 on his jersey in Texas. Woodward played for the Sounds in 2008 when they were a Brewers affiliate. It was toward the end of his career, and he appeared 71 games, hitting .291 with a .341 on-base percentage. He’d begun that season with the Phillies before being released and signing with Milwaukee. Interestingly, that 2008 season is the only one from 1999-2011 when Woodward did not appear in at least one major league game, and that ’08 Brewers team reached the postseason for the first time since 1982. Woodward spent all or parts of 12 seasons in the major leagues and totaled 659 games between the Blue Jays, Mets, Braves, Mariners and Red Sox. Woodward now is one of three former Sounds who’ll be managing in the big leagues in 2019. He joins 2018 AL Manager of the Year Bob Melvin (’85) of the A’s and Don Mattingly (’81) of the Marlins. Buck Showalter (’80-’83) was in that group before the Orioles announced last month he would not be retained next season. It’s down to two! The World Series begins tonight in Boston, and it’s the Red Sox and the Dodgers. This postseason has been loaded with former Sounds from the start, and both the Red Sox and the Dodgers feature multiple former Sounds. 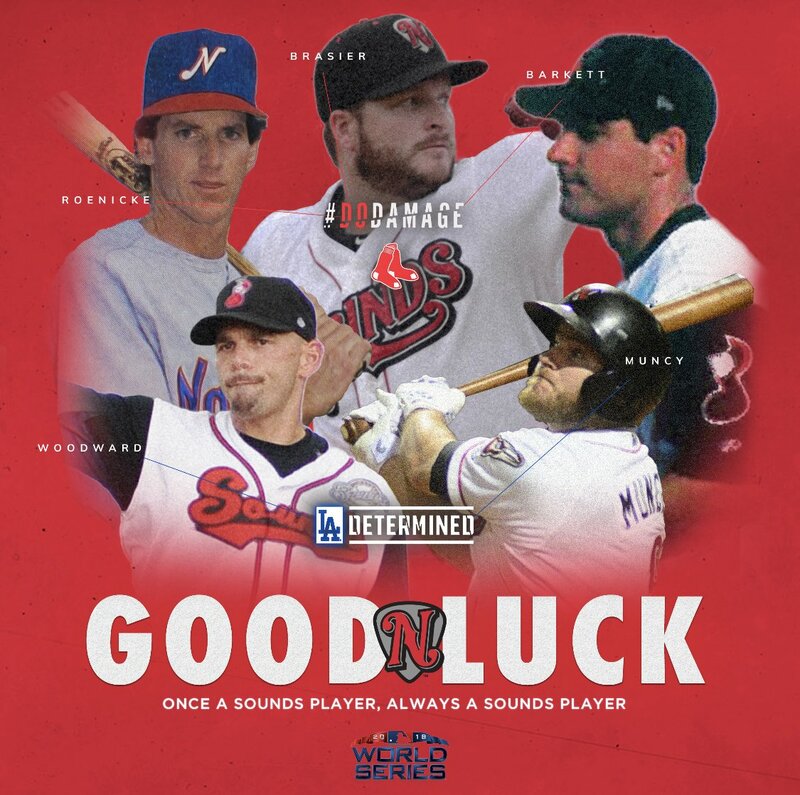 Each of the original 10 clubs in the postseason had at least one former Sound on the roster either as a player, manager or coach, and it’s possible the Sounds are the only minor league team that can claim that. Here are the former Sounds to watch for in the World Series, as well as links to the previous posts about the earlier rounds of the postseason. Fun fact: The Red Sox have been around since 1908, and their 108 wins this year were a franchise record. The Red Sox are in the World Series for the first time since 2013 when they beat the Cardinals. Boston has one former Sound on their active roster and two on their coaching staff, as well as two very recognizable Middle Tennessee natives. Former Sound Ryan Brasier (’15-’16) was named a Triple-A all-star this year at Pawtucket but didn’t appear in the game because he was called up to Boston. He posted a 1.60 ERA in 34 appearances in his return to the big leagues and has become a reliable late-game reliever for Boston, posting seven scoreless outings in the playoffs so far. He was a crucial part of the Sounds’ division-championship team in ’16. He was joined in the Boston bullpen in the regular season by former Sound Tyler Thornburg (’12-’13), who missed all of last year and fought his way back from Thoracic Outlet Syndrome to make 25 appearances for the Red Sox this year. Thornburg has not been on the Red Sox postseason rosters to this point. David Price, the Murfreesboro native and former Vanderbilt star, went 16-7 with a 3.58 ERA in 30 starts during the regular season for Boston. He’d had two mediocre starts in the playoffs before delivering a huge performance in Houston last Thursday in the series-clinching Game 5, tossing six scoreless innings with no walks and nine strikeouts. Mookie Betts, the Nashville native and Overton High School alum, hit .346 with 32 homers and 80 RBIs in 136 games and is the likely AL MVP. He’s batted .205 so far this postseason. First-year manager Alex Cora’s bench coach is former Sound Ron Roenicke (’88), the former Brewers manager who played in 83 games with the Sounds as a Reds minor leaguer in 1988. Boston’s assistant hitting coach is Andy Barkett (’01), who played in 91 games as a Sound in 1991 for the Pirates and was called up for his major league debut that season. It’s his first year as a major league coach after many years as a minor league manager, coach and coordinator. Fun fact: The Dodgers are in the playoffs for a franchise-record sixth straight season. This is the first time since 1977-78 they’ve won consecutive NL pennants. The Dodgers are in the World Series for the second year in a row, and they’re looking to claim the first title since 1988. They once again boast a pair of former Sounds on manager Dave Roberts’ coaching staff. Their third base coach is Chris Woodward (’08), who played 12 years in the major leagues and hit .291 in 71 games for the Sounds in 2008. The Dodgers’ hitting coach is former Sound Turner Ward (’99), who also played 12 years in the major leagues. He hit .292 in 35 games for the Sounds in 1999. Woodward and Ward observed first-hand the monster season from former Sound Max Muncy (’15-’16), who went from an unsigned minor league free agent in early ’17 after being let go by the A’s to an everyday big leaguer and a Home Run Derby participant who smashed 34 homers this year. His only two hits in the NLDS against the Braves were home runs, and he had four hits and drew four walks against the Brewers in the NLCS. Speaking of a flair for the dramatic, among the things I’ll never forget about Muncy is his game-winning hit in extra innings in the inaugural game at First Tennessee Park on April 18, 2015. What a way to open a new ballpark! The Dodgers had two former Sounds on their roster late in the season they’ve elected to leave off their postseason rosters to this point. One is the amazing switch-pitcher Pat Venditte (’15), who went back and forth several times this year from L.A. to OKC. He posted a 2.57 ERA in 15 appearances in the big leagues. The other is John Axford (’09-’10, ’17), who worked in 45 games for the Blue Jays before the Dodgers acquired him in late July. Other local connections with the Dodgers include Vanderbilt alum Walker Buehler, the Dodgers’ 1st-round pick in ’15 who made his major league debut last year, and pitching coach Rick Honeycutt, a Chattanooga native, former UT Vol and a member of the Tennessee Sports Hall of Fame. The MLB Postseason resumes Friday night with the National League Championship Series between the Dodgers and Brewers and continues Saturday with Game 2 of that series and Game 1 of the American League Championship Series between the Astros and Red Sox. The postseason has been loaded with former Sounds from the start, and the LCS round has multiple former Sounds on each team. Each of the original 10 clubs in the postseason had/has at least one former Sound on the roster either as a player, manager or coach, and it’s possible the Sounds are the only minor league team that can claim that. As many 50 former Sounds could be involved by the end depending on roster decisions as the playoffs unfold. Below is a breakdown for the two LCS match-ups, as well as links to the previous posts about the Wild Card Games and the Division Series round. The Brewers have three former Sounds on their active roster, all of whom were with the Sounds during that affiliation. Lorenzo Cain (’08, ’10) made his return to Milwaukee this year as one of the big off-season acquisitions by the Brewers (also see Yelich, Christian). They’d drafted him in ’04 and then included him in the trade with Kansas City that brought Zack Greinke to Milwaukee going into ’11, which was the last Brewers playoff season until now. Cain hit .308 with a career-high 30 steals this year in a lineup that continues to boast one of the all-time Brewers greats, Ryan Braun (’07). Braun had 20-plus homers for the ninth time in his career and went 5-for-13 in the NLDS. He’s a career .380 hitter in the postseason. The Brewers’ bullpen is nasty, and a big reason why is former Sound Jeremy Jeffress (’14), one of three Milwaukee relievers with 10-plus saves. Jeffress owns a 1.29 ERA in 73 appearances. The Brewers also have a pair of former Sounds on manager Craig Counsell’s field staff. Their hitting coach is Darnell Coles (’92), who played in 22 games for the Sounds in 1992 when they were a Reds affiliate. He hit six homers in those 22 games, and three of them came on April 10 at Denver that season when he tied a franchise record. He remains one of seven Sounds all-time to hit three homers in one contest. He technically was also the Sounds’ manager for a brief time. He’d been named to that post by the Brewers in October ’13 before getting a major league coaching job with the Tigers later that off-season. The Brewers then replaced him in Nashville with Rick Sweet, who managed the Sounds in ’14 and has been Milwaukee’s Triple-A manager ever since. Former Sounds catcher Robinzon Diaz (’14) serves as the Brewers’ bullpen catcher. It’s his second season in that role. He played in 38 games for the Sounds in ‘14 and retired as a player after the ’16 season. The Brewers have another local connection on their staff with pitching Derek Johnson, who was Vanderbilt’s pitching coach for 11 years (’02-’12) before he joined the Cubs as their minor league pitching coordinator. It’s his third season as Brewers pitching coach. Part of what makes the Brewers’ pitching staff so impressive is they’ve been without one of the anchors of their starting rotation, former Sound Jimmy Nelson (’13-’14), all season. He’s recovering from a right shoulder injury. The Dodgers once again boast a pair of former Sounds on manager Dave Roberts’ coaching staff. Their third base coach is Chris Woodward (’08), who played 12 years in the major leagues and hit .291 in 71 games for the Sounds in 2008. The Dodgers’ hitting coach is former Sound Turner Ward (’99), who also played 12 years in the major leagues. He hit .292 in 35 games for the Sounds in 1999. Woodward and Ward observed first-hand the monster season from former Sound Max Muncy (’15-’16), who went from an unsigned minor league free agent in early ’17 after being let go by the A’s to an everyday big leaguer and a Home Run Derby participant who smashed 34 homers this year. His only two hits in the NLDS against the Braves were home runs. Speaking of a flair for the dramatic, among the things I’ll never forget about Muncy is his game-winning hit in extra innings in the inaugural game at First Tennessee Park on April 18, 2015. What a way to open a new ballpark! The Dodgers had two former Sounds on their roster late in the season they’ve elected to leave off their postseason rosters to this point. One is the amazing switch-pitcher Pat Venditte (’15), who went back and forth several times this year from L.A. to OKC. He posted a 2.57 ERA in 15 appearances in the big leagues. The other is John Axford (’09-’10, ’17), who worked in 45 games for the Blue Jays before the Dodgers acquired him in late July. Other local connections with the Dodgers include Vanderbilt alum Walker Buehler, the Dodgers’ 1st-round pick in ’15 who made his major league debut last year, and pitching coach Rick Honeycutt, a Chattanooga native, former UT Vol and a member of the Tennessee Sports Hall of Fame. Fun fact: Prior to last year, the Astros had reached 100 wins one time in 55 seasons. Now they’ve done it two seasons in a row. One of the Astros’ key mid-season acquisitions was getting former Sound Martin Maldonado (’09-’12) from the Angels. Maldonado won a Gold Glove last year with the Angels and combined to play in 119 games this year between the two clubs. He went 1-for-8 in the ALDS, and the one hit was a home run. The Astros’ potent offense continues to feature outfielder Josh Reddick (’16), who spent a week with the Sounds in June ’16 on a rehab assignment for the A’s. He was coming back from a left thumb fracture and had 25 at-bats in six games. The Astros’ third base coach under manager A.J. Hinch is former Sounds hitting coach Gary Pettis (’05), who was with the Sounds the first year of their affiliation with the Brewers that culminated with a PCL title. Pettis joined the Astros last year after spending several seasons as third base coach with the Rangers under Ron Washington. Franklin native and former Vanderbilt star Tony Kemp has scratched and clawed his way to a more full-time spot on the loaded Houston roster this year. He played in 97 games this season and hit .263 with 30 RBIs and a .351 on-base percentage. Two years ago Kemp was having a Nashville homecoming with Fresno when he got word of his first-ever major league call-up. Fun fact: The Red Sox have been around since 1908, and their 108 wins this year are a franchise record. For the ALCS, the Red Sox have one former Sound on their active roster and two on their coaching staff, as well as two very recognizable Middle Tennessee natives. Former Sound Ryan Brasier (’15-’16) was named a Triple-A all-star this year at Pawtucket but didn’t appear in the game because he was called up to Boston. He posted a 1.60 ERA in 34 appearances in his return to the big leagues and has become a reliable late-game reliever for Boston, posting three scoreless outings in the ALDS against the Yankees. He was a crucial part of the Sounds’ division-championship team in ’16. He was joined in the Boston bullpen in the regular season by former Sound Tyler Thornburg (’12-’13), who missed all of last year and fought his way back from Thoracic Outlet Syndrome to make 25 appearances for the Red Sox this year. Thornburg has not been on the Red Sox postseason rosters to this point. David Price, the Murfreesboro native and former Vanderbilt star, went 16-7 with a 3.58 ERA in 30 starts, and Mookie Betts, an Overton High School alum, hit .346 with 32 homers and 80 RBIs in 136 games and is the likely AL MVP. First-year manager Alex Cora’s bench coach is former Sound Ron Roenicke (’88), the former Brewers manager who played in 83 games with the Sounds as a Reds minor leaguer in 1988. Boston’s assistant hitting coach is Andy Barkett (’01), who played in 91 games as a Sound in 1991 for the Pirates and was called up for his major league debut that season. It’s his first year as a major league coach after many years as a minor league manager, coach and coordinator. The MLB Postseason continues Friday with a quadruple-header. Both of the American League Division Series get underway, and the two National League Division Series take the field for their Game 2. In the AL, the Indians visit the Astros, and the Yankees take on Boston. 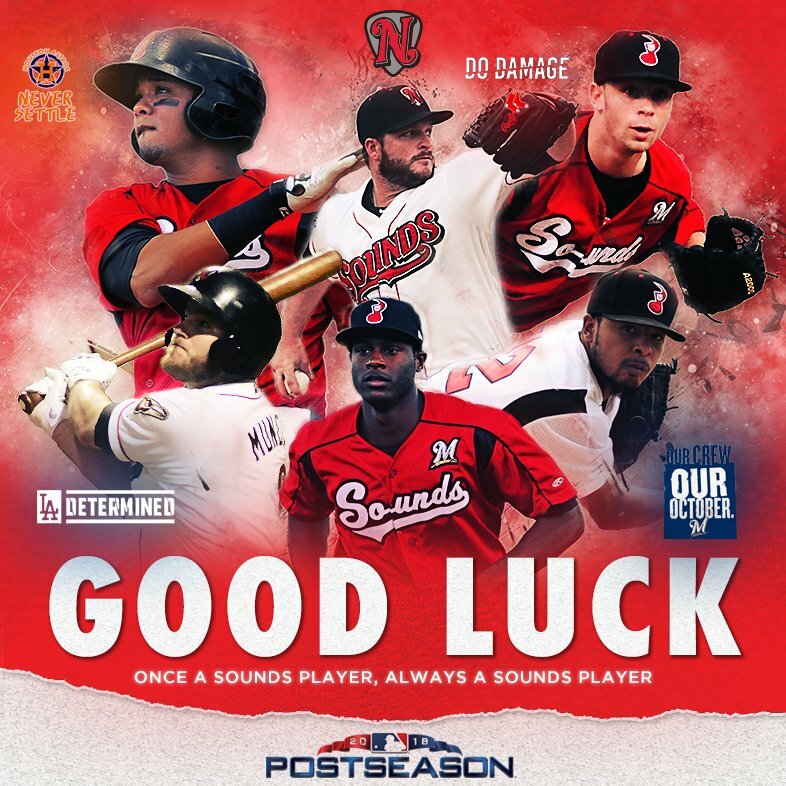 Each of the 10 clubs in the postseason had/has at least one former Sound on the roster either as a player, manager or coach, and it’s possible the Sounds are the only minor league team that can claim that. As many 50 former Sounds could be involved by the end depending on roster decisions as the playoffs unfold. Below is a breakdown for the two ALDS match-ups, as well as links to the previous posts about the Wild Card Games and the NLDS. Fun fact: The Indians are making a third consecutive playoff appearance for the first time since they won five straight division titles from ‘95-‘99. Reliever Dan Otero (’15) once again was a frequently-used arm in the Cleveland bullpen. He worked in 61 games, second-most on the team, and had a 5.22 ERA. His pitching coach is former Sound Carl Willis (’87), who’s in his first year in Cleveland after time with Boston. Willis made 267 appearances in the major leagues over nine years from ’84-’95. His Sounds time came in ’87 during his stint in the Reds organization, and he owned a 4.20 ERA and tied for the team lead in appearances with 53. The Sounds’ pitching staff that year included future Reds stalwarts Rob Dibble, Tom Browning and Norm Charlton and future Royals Hall of Famer Jeff Montgomery. One of the Astros’ key mid-season acquisitions was getting former Sound Martin Maldonado (’09-’12) from the Angels. Maldonado won a Gold Glove last year with the Angels and combined to play in 119 games this year between the two clubs. The Astros’ potent offense continues to feature outfielder Josh Reddick (’16), who spent a week with the Sounds in June ’16 on a rehab assignment for the A’s. He was coming back from a left thumb fracture and had 25 at-bats in six games. The Astros’ third base coach under manager A.J. Hinch is former Sounds hitting coach Gary Pettis (’05), who was with the Sounds the first year of their affiliation with the Brewers that culminated with a PCL title. Pettis joined the Astros last year after spending several seasons as third base coach with the Rangers under Ron Washington. Franklin native and former Vanderbilt star Tony Kemp has scratched and clawed his way to a more full-time spot on the loaded Houston roster this year. He played in 97 games this season and hit .263 with 30 RBIs and a .351 on-base percentage. Two years ago Kemp was having a Nashville homecoming with Fresno when he got word of his first-ever major league call-up. For the ALDS, the Red Sox have one former Sound on their active roster and two on their coaching staff, as well as two very recognizable Middle Tennessee natives. Former Sound Ryan Brasier (’15-’16) was named a Triple-A all-star this year at Pawtucket but didn’t appear in the game because he was called up to Boston. He posted a 1.60 ERA in 34 appearances in his return to the big leagues. He was a crucial part of the Sounds’ division-championship team in ’16. He was joined in the Boston bullpen in the regular season by former Sound Tyler Thornburg (’12-’13), who missed all of last year and fought his way back from Thoracic Outlet Syndrome to make 25 appearances for the Red Sox this year. Thornburg is not on the roster for the ALDS. David Price, the Murfreesboro native and former Vanderbilt star, went 16-7 with a 3.58 ERA in 30 starts, and Mookie Betts, an Overton High School alum, hit .346 with 32 homers and 80 RBIs in 136 games and is the likely AL MVP. First-year manager Alex Cora’s bench coach is former Sound Ron Roenicke (’88), the former Brewers manager who played in 83 games with the Sounds as a Reds minor leaguer in 1988. Boston’s assistant hitting coach is Andy Barkett (’01), who played in 91 games as a Sound in 1991 for the Pirates and was called up for his major league debut that season. It’s his first year as a major league coach after many years as a minor league manager, coach and coordinator.